Bring on the stems, leaves, grasses — I’m always in the mood for ‘green’ fragrances. Green-tinged perfumes are refreshing and often “cool” in tone; they convey the idea of “growth,” especially new growth of plants. Spring is the perfect time for a green cologne to debut, and I’ve been looking forward to smelling Parfumerie Generale Papyrus de Ciane (No. 24). Perfumer Pierre Guillaume has gotten a lot of online media coverage for Papyrus de Ciane and much of it references his use of a legendary component of early 20th century fragrances: Mousse de Saxe. I’ll let others discuss the chemical composition of Mousse de Saxe and its reconfiguration for Papyrus de Ciane; my only “concern” is: How does Papyrus de Ciane smell on me? Papyrus de Ciane’s “published” list of notes is varied (online at Parfumerie Generale only five components are mentioned: galbanum, broom, mild plant note, Mousse de Saxe, Silvanone® Supra (musk); in interviews, Guillaume has also mentioned bergamot, neroli, mugwort, cistus labdanum, lavender, clove, vetiver, incense and hedione. Papyrus de Ciane begins with a mix of citrus, “white flowers” and delicious and strong galbanum (the galbanum crystallizes and turns soft and powdery fast); Papyrus de Ciane’s green notes are not wild and sharp or particularly “clear and water-y” (as the references to papyrus and the River Ciane may lead you to believe) — they’re talc-y and cloudy. As Papyrus de Ciane dries down, I detect small “puffs” of cistus labdanum/(birch tar?) and frankincense. When the fragrance reaches the end of its development, I smell vetiver, comfy musk and clean moss; these notes meld to form a pleasing smoky-green/vegetal-musky powder (let’s call it “green pollen”). Papyrus de Ciane (while not smelling exactly like any of them) reminded me of several perfumes I’ve worn recently — a scent by Issey Miyake (more “lush” and decidedly more feminine than Papyrus de Ciane), Nasomatto China White (more audacious, intense and quirky) and Annick Goutal Ninféo Mio (crisper, more herbal-green). Parfumerie Generale Papyrus de Ciane is available in 30, 50 and 100 ml Eau de Parfum (59€, 88€ and 120€ respectively); for buying information, see the listing for Parfumerie Generale under Perfume Houses. * Spring by Sogi (1421-1502) translated by Steven Carter, pg. 196, in Zen Poems (Selected and Edited by Peter Harris), Alfred A Knopf, Inc./Everyman’s Library, 1999. 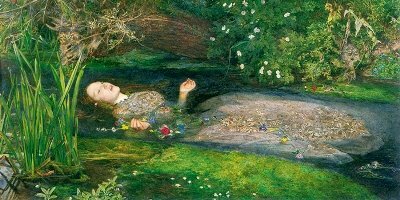 Note: top image is Ophelia [cropped] by John Everett Millais via Wikimedia Commons. Great review, Kevin. I’m so thrilled to read it because a split of this is coming my way in the near future – hooray! Also, Millais’ Ophelia is a favorite of mine — and it’s perfect for your review. I admire your way with words, images, and of course, scents! mjr17: Thanks! And enjoy your Papyrus de Ciane. Thanks for the thoughtful review, Kevin, I’m looking forward to trying this one. I love the choice of painting, too, which is making me wonder what a Pre-Raphaelite would smell like. Apres l’Ondee for Waterhouse? And Parfum Sacre for Rossetti? Capillary: yes, interesting idea to ponder! Rossetti had a pet wombat, so I imagine mega-hamster cage, turpentine, and a bit of saffron and benzoin from laudanum additives. aimilona: we’ll convert the wombat to “musk” and the hamster cage to “hay” and it could be good! Dear Kevin: You just made me realize that a “green” fragrance is just what I’m missing from my wardrobe! Beautiful review, as always! Love the quote! Minnie: you must have a green in your collection! Hi Kevin. I can’t wait for my small decant of this to arrive. I too wondered if it were similar to A Scent or even Cristalle Eau Verte. It certainly sounds less floral (both of those can be a bit screechy). I love the idea of “green pollen.” I just received a bottle of Amyitis by Mona di Orio and that description fits it well: it’s a very unusual and mossy scent, and nothing like any other “greens” I’ve owned or sampled. I anticipate smelling Papyrus soon (and I’m glad PG is doing 30ml bottles now!). A commenter on one blog stated, “Inflammation of the Amy.” I’ll try to remember to send you a sample. to me this did not resemble Cristalle Eau Verte. It did remind me quite a bit of the original (vintage?) Cristalle. Very green with a sharpness that was almost peppery….not black pepper but more like jalepeno peppers. A lot of leaves and grasses…I didn’t get a floral note at all in it. But my skin tends to “pick-a-note” and runs with it. Thanks for this review. Talc-y and cloudy green notes sound like something that I need to try. So many green scents are too sharp and headache inducing for me. Thanna: I like sharp greens too, but this is a nice change. This has been sounding test-worthy before but then you compared it to China White, my most recent FB purchase. The fact that nothing in my current collection is green makes this even more appealing. Thanks for the review! It’s wonderful to read a review that both tells me, clearly, how a fragrance smells as well as how it feels. Another beautifully-written review, Kevin, thanks. “Nostalgic green pollen” will be getting nose time with me soon. Maybe when spring finally arrives, I’ll manage to dig up a sample. There’s still snow on the ground here; I know that any green scent is likely to be underwhelming in this weather. But spring always comes, doesn’t it? I wish our “green scent” season was longer here, too. By this time of year, I’m beyond tired of winter and itching to wear all my greens… but you’re right, in this weather, they fall a bit flat. A small decant of this one is headed my way as well… and it’s a good thing, because K’s review would have me kicking myself otherwise for missing it. boojum: hope you like it! Spritzed a little on this morning…and after a quick blast of green, I get straight church incense. I’d love this in a candle; on skin, I’ll have to give it a few more tries to see if I can pull it off. What a lovely and touching review Kevin – I got a little misty. Almost everything about this fragrance, in theory anyway, sounds tempting. Even the lavender doesn’t scare me [which could be a difficult note for me] – it doesn’t seem to be a big factor here. I really want to give this a try. RusticDove: no, do not let lavender scare you off…I really didn’t detect it. well, darn it Rustic, seems like my shipping label /printer snaffu is working in your favor—-I still have your package in my car ready to mail (most of the others made it out before the missing ink problem) I shall slice ‘er open and send you a sample of Papyrus! I’ll do it now so I don’t forget. So evocative of spring and hope and everything verdant and green….this sounds like a must have for me. Who wrote the quote? Beautiful review! meadowbliss: see the note at the bottom of the post: Sogi. There is nothing pleasing about spring pollen, green or otherwise. Astra: I assume you’ll be sneezing and wheezing your way thru spring/summer? I realised I didn’t have a green in my wardrobe and I crave a green (is it the spring coming?). Cabaret and Eau de Jatamansi are not enough. The greenest I have is…Jardin en mediteranee. I am desperate. Raluca: you need “greener” for sure! Dang it, just when I thought I had my lemming under control? (Why does that sound like I own an unruly varmint?) I’ll have to put a sample order in for this when I buy my Bois Blond. Not that anyone cares, but that was supposed to be an exclamation point and not a question mark after the first sentence. And don’t feed it bananas. Ah, miss Kitty—your packet is in the same lamentable group as Rustic’s —-I’ll send you a sample…..going to get both packets now…. We lucked out Miss K.
“luck” was not one of the words I was using at the time I was having my printer issues….the spelling is close though. Now I don’t feel so badly about the packets that got held up! The Perfume Gods knew you would need something added…. Well, I’m glad it worked in our favor that your printer lucked up. Hee hee. I agree with you…I loooooove greens in the spring! I’m always ready for Bel Respiro, Chanel no19, CdG’s Calamus when March hits…I’ve also been really looking forward to trying Papyrus (am waiting for a decant) and am even more impatient following your review! Sounds like I need to add Calamus to the to-try list, judging by the company it’s in! lovethescents: may it arrive soon. I’m with you folks who love the sound of green pollen. Thanks for the new item for my test list, Kevin! Haunani: referencing Miss K above is that a Thanks! (I’m so happy!) or Thanks? (Am I really ordering another sample?) HAHA! Well, um, a little of both! Wow, this sounds fabulous especially due to your poetic writing! I love all the notes – however I do find I am quite allergic to “white florals” so I’m hoping their subdued compared to the glorious greens! How perfect for this time of year! I am starting to watch my bulbs emerge from all the browns and greys in my gardens. I am happily anticipating a glorious Utah Springtime. Lucy-Belle: same here…the cherry and plum trees are in full bloom and I’m very happy. The white floral note (orange blossom?) does not stand out too much…it blends “into” the perfume nicely. One of the interesting distinctions of mugwort: “Much used in witchcraft, mugwort is said to be useful in inducing lucid dreaming and astral travel/astral projection.” This perfume will have some advantageous aspects. Rustic Dove: I’ve had WAAAAY too much lucid dreaming lately. Now I’m wondering if my screams were induced by that tuna sandwich or Papyrus de Ciane! HA! This just may be your answer! I just ordered the Spring Spritz Sample pack from LuckyScent and Papyrus happens to be in the pack can’t wait to try this. Yes! I just got that email and I’m going to order it too. Ajuarez: hope you enjoy it…pour on the whole sample vial for the REAL experience. I too just purchased the sample pack and am looking forward to trying all the scents (I already love Tocca’s Bianca!) Thanks for the review Kevin. Maggie: you’re welcome…seems we all got that LuckyScent email at the same time. HA! I agree that it smells somewhat ‘retro’, but not in a bad dated way. Did you get much lavender? When smelling my arm, besides the green notes, lavender was there smiling at me. LOL. Teger: no, didn’t get much lavender at all…it was “submerged” I thought. FYI – I just got an email notice that Luckyscent currently has a Spring Spritz sample pack which includes PG Papyrus de Ciane, Tocca Bianca, Calypso Bellini and M. Micallef Shanaan PLUS a complimentary sample of L’Eau Serge Lutens (reviewed today on Perfume Posse) for $12 (+$5 for shipping to Canada, not sure about US). It happens to hit a couple I have on my “to try list” and a few I’ve never even heard of, so I’m giving it a whirl. p.s. I have no affiliation with Luckyscent. My apologies if this heads-up is against any rules. Proximity: you’re welcome…Sogi is a favorite. What a beautifully written post, Kevin. I’ve been itching to try some greens lately, as I’ve grown so bored of my heavy winter samples. Spring is definitely here in socal (we had a lot of rain this winter! ): little buds have already begun making their appearance on top of barren branches and there’s a crisp, green scent in the air. I’m off to buy that spring sample pack on Luckyscent! Bookgirl: I always loved L.A. after a rainy winter…the hills were so GREEN and clean looking. Enjoy the sample pack! Just tried it… love it. Reminded me right away of China White, if softer and without the heavy burnt sugar Nasomatto note. Was very glad to see it reminded in the review. It seems like a wonderful cool weather alternative to my Chanel no. 19/ Bandit. Very late comment. Just tried this. It’s gorgeous! !